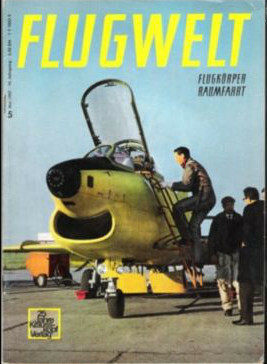 ‘Flugwelt’ was a highly respected aerospace technology magazine from West Germany. Until 1961 it was the official organ of the Bundesverband der Deutschen Luftfahrtindustrie, and from 1963 the organ of the Club der Luftfahrt. From 1964 Nr.3, the title was revised to ‘Flugwelt international’. Each issue was packed with information on all types of aircraft accompanied by many photographs and line drawings. The editors were orignally Otto K Krausskopf, later Wolfgang Wagner then Stefan Geisenheyner, Erich W. Muller and finally Erwin H. Schuldt. The magazine was taken over and absorbed into the rival publication ‘Flug Revue’ after the April 1968 issue. See other aviation-related magazines from Germany.